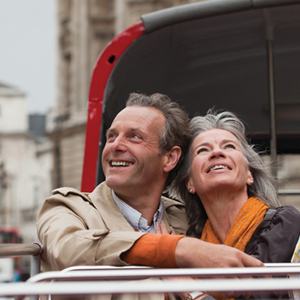 To find your ideal vacation, browse our comprehensive selection of guided coach tours to Britain that vary in length from 8 - 24 days. Choose value-for-money first class programs, splurge with deluxe properties or find something in between. All of our quality escorted coach tours to Britain feature prepaid daily sightseeing, excellent hotels, full breakfasts, most dinners, including specialty dinners with entertainment and, most importantly, no hidden extras! Our tour guides do not sell any optional tours so that they can focus 100% on your vacation enjoyment! The spectacular Royal Edinburgh Military Tattoo is enjoyed by over 100 million people on TV worldwide. It's a thrilling experience to see the live show on the Esplanade of Edinburgh Castle during the three-week season in August. Tattoo tickets are featured on all CIE Tours' vacations staying in Edinburgh during that time. Click here to view our full range of itineraries that include the 2018 Tattoo. Select tours below offer you this exclusive experience with an average of just 24 guests on select departures. Please continue through to the Dates & Prices page of the tour for individual departure dates. 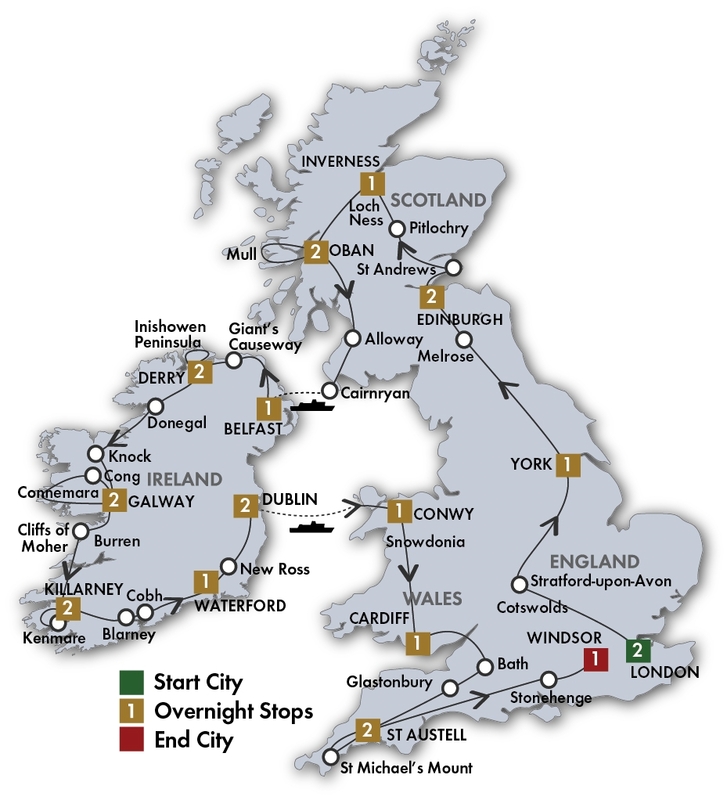 Also consider one of our popular vacations combining England with Scotland, Ireland and Wales. If you need help in deciding which tour is right for you, just call us at 1-800-243-8687 to discuss with one of our friendly CIE Tours travel advisors. Visit England and Scotland, seeing the highlights of London; exploring the musical heritage of Liverpool, the home of the Beatles; traveling through the Lake District which inspired Beatrix Potter. Visit Edinburgh; enjoy a festive traditional dinner and Scottish ceilidh; taste whisky in the distillery where it is made, and more! 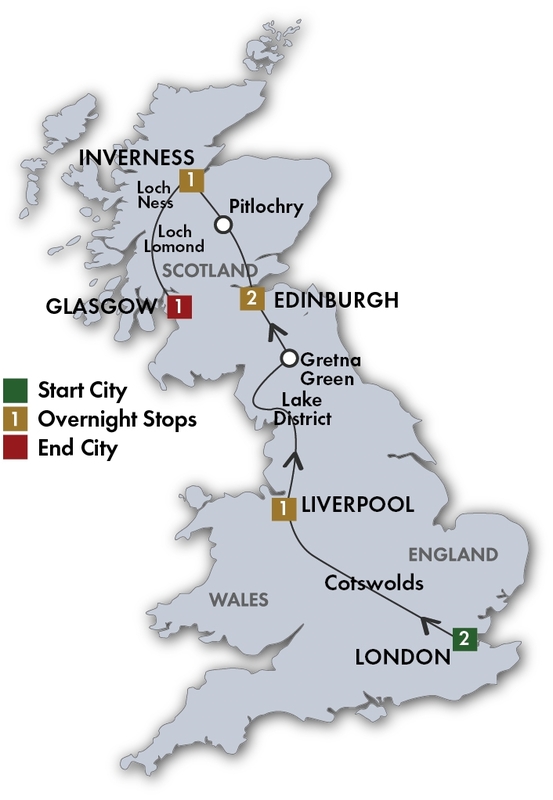 Start in London with visits to St Paul’s Cathedral and the Tower of London and end in Glasgow. Experience the essence of Britain – Shakespeare’s Birthplace, Cotswolds, Beatles’ Liverpool and Lake District. Cross the Scottish border to stay in Edinburgh and visit St Andrews, view Highland peaks and valleys and cruise Loch Lomond. 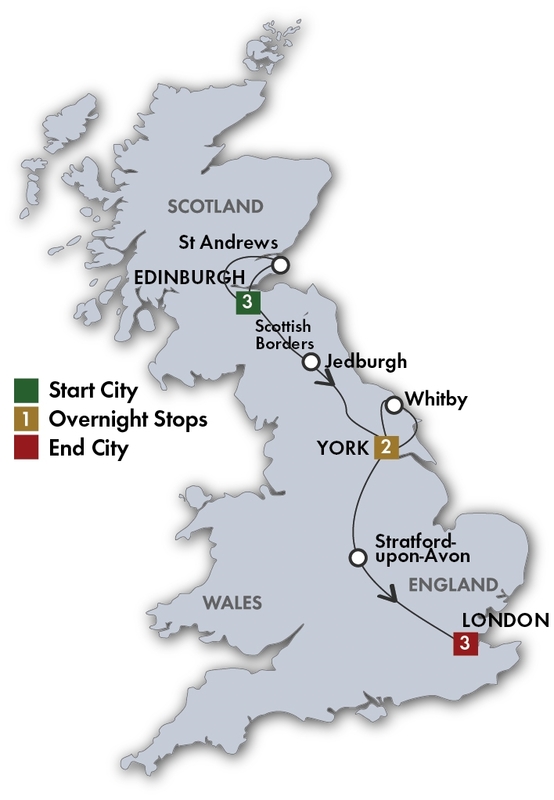 Focus on Edinburgh, York and London at a leisurely pace with 2- and 3-night stays in each. Enjoy city sightseeing tours and experience other locations such as the golfing town of St Andrews, fishing port of Whitby, Shakespeare’s Stratford-upon-Avon and more. Gentle walking tours and Scottish and pub evenings enhance the experience. Start in London to visit St Paul’s Cathedral and the Tower of London. Discover historic Stonehenge and the Roman spa in Bath. Feast at Cardiff Castle’s Welsh banquet and travel north to Caernarfon, with its dramatic castle and stunning scenery. 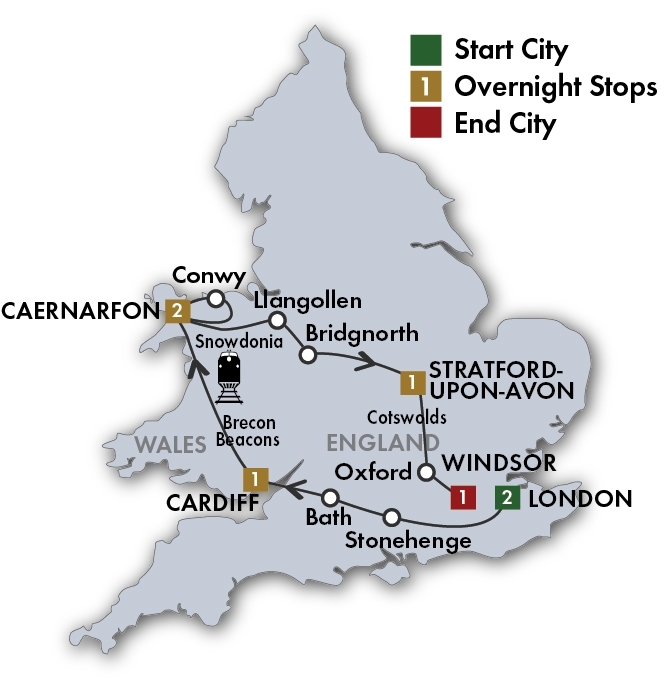 Stay in Stratford-upon-Avon and explore Oxford on foot before ending in royal Windsor, close to London. Explore the west of England with tastes of Wales and Scotland. 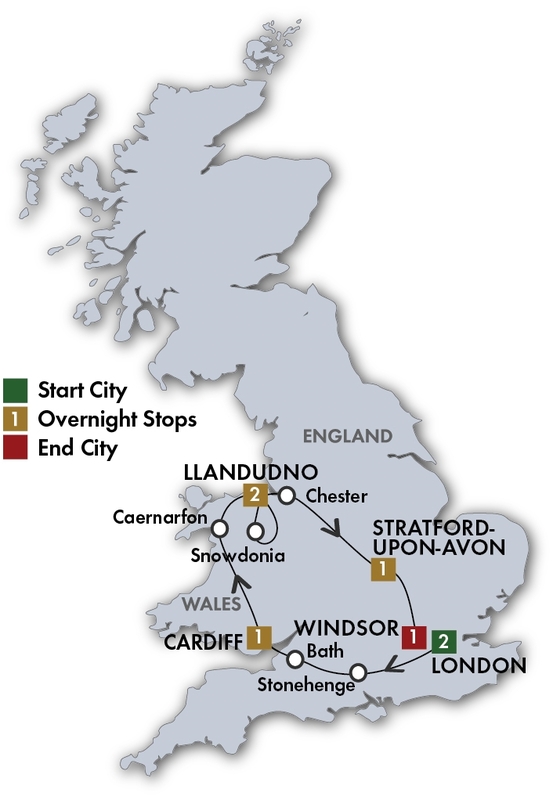 Start in Windsor, near London and travel to Devon and Cornwall. Head to Cardiff Castle for a Welsh banquet, tour Shrewsbury with a town crier, explore Chester and the Lake District. End with a 3-night stay in Edinburgh. Spend a full day in St Andrews. 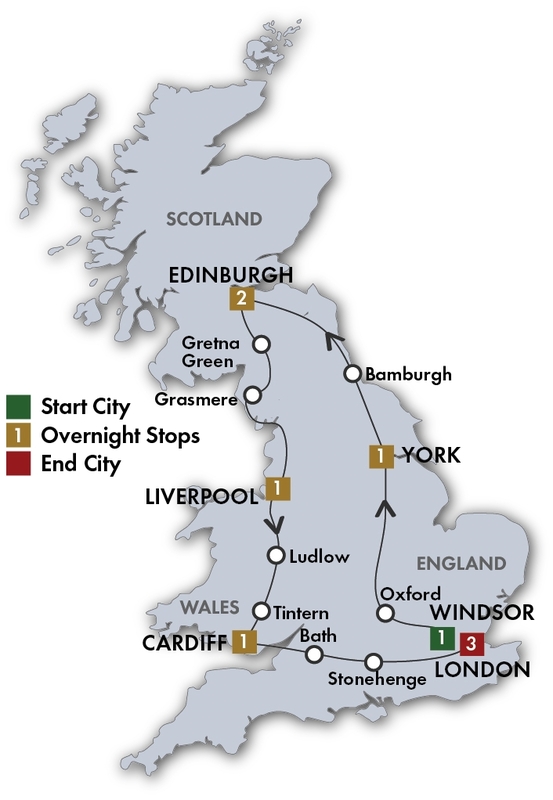 The quintessential tour if you would like to see a lot of Britain in a short time – from Windsor Castle to historic York, from Beatles’ Liverpool to Edinburgh Castle, from a Welsh Evening in Cardiff to cosmopolitan London. Enjoy daily sightseeing, full breakfasts and five dinners including three special dinner/shows. 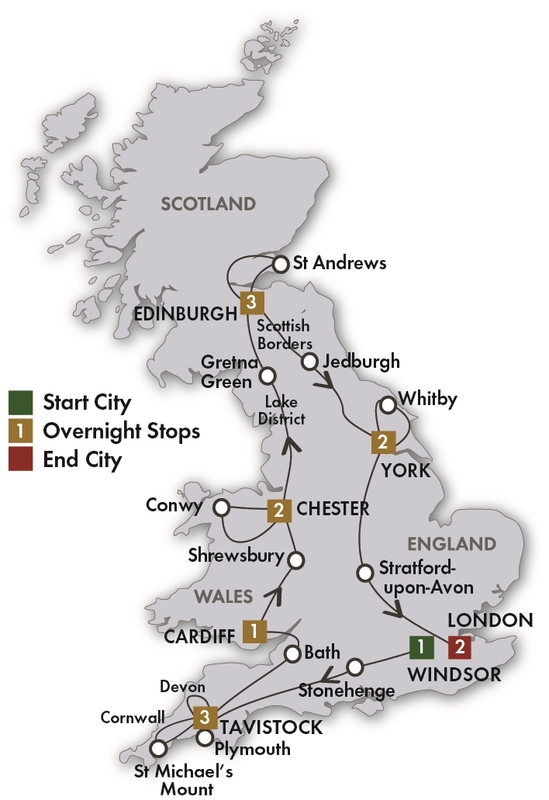 Our most comprehensive tour of Britain, with 2- and 3-night stays in most locations. Experience famous classic sights in London, Stonehenge, Bath, Cardiff, Edinburgh and York. Try fish ‘n chips in Whitby, explore Cornwall’s Minack Theatre, browse the used-book capital of Hay-on-Wye, walk around Shrewsbury with a town crier and spend a full day in St Andrews. Extend your vacation with an optional 3 days in Paris! Our longest, comprehensive itinerary taking in a wealth of highlights while staying at great hotels with most meals included. 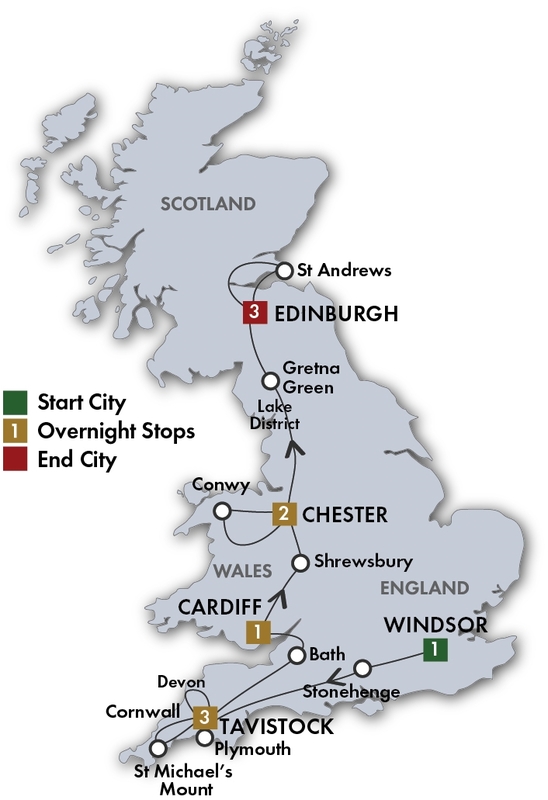 Start in London and visit Stratford-upon-Avon and York before staying in Edinburgh. Explore the Scottish Highlands and journey around most of the Irish coastline. 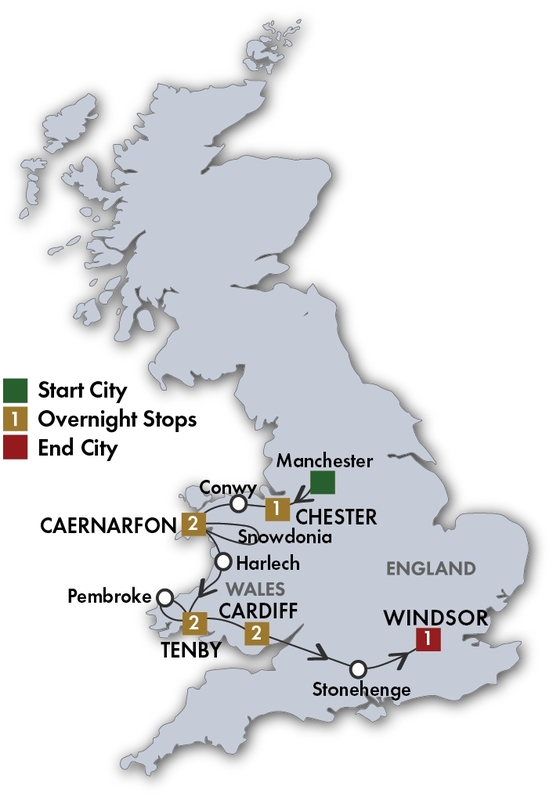 Travel through Wales and England’s West Country before ending in Windsor, close to London. London is one of the most cosmopolitan cities in the world. Whether you’re looking to walk in the footsteps of Shakespeare and Dickens, tour the castles in hope of spotting Harry and Meghan, or eat great ethnic foods from every continent, London will entice you with its charms and exceed your expectations. 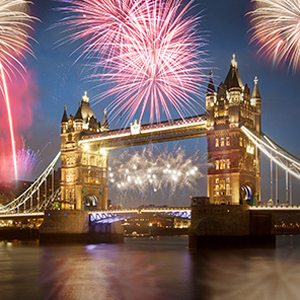 You can be in London to celebrate New Year’s Eve – maybe you’ll choose to join the crowds watching the fireworks over the Thames! We could not find any trips to match your query. Please expand your search to try again.